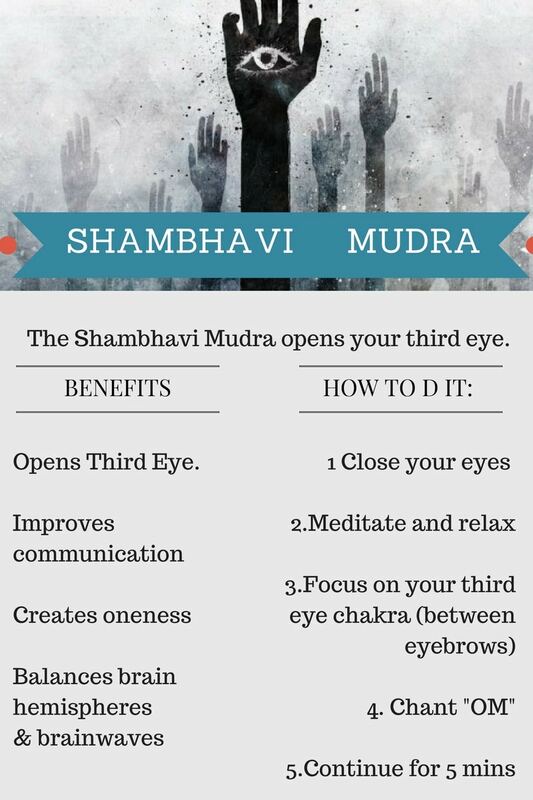 The Shambhavi mudra, or “Eyebrow Gazing Mudra” is a powerful way to activate your third eye chakra. 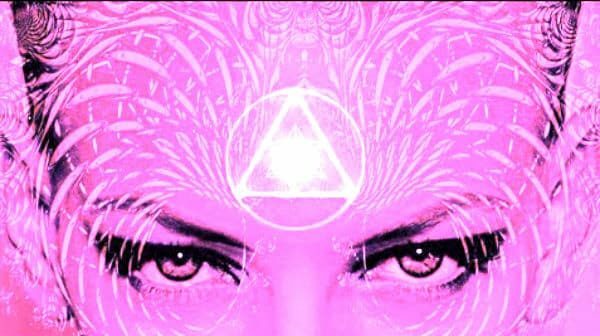 When you active your third eye chakra you gain insight into the true nature of things, and you tap into your intuition and your psychic insight. 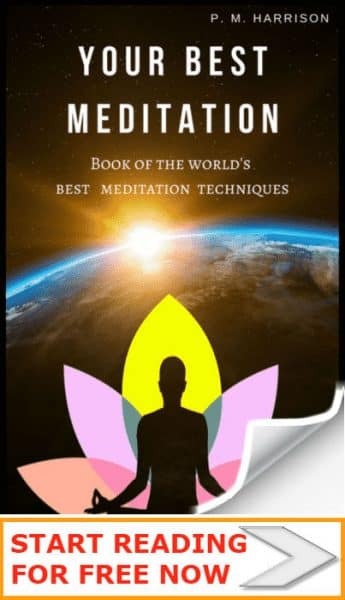 As you guys know from reading my Ultimate Guide To Mudras, there are more than 60 mudras. The Shambhavi mudra is one of the most powerful of them all. The Shambhavi mudra procedure originates from several ancient sacred texts: “Vijnana Bhairava Tantra“, “Hathapradipika”, and “Samhita.” The three texts describe the mudra in similar ways and suggest that using this mudra will create heightened level of insight. The Shambhavi mudra is a fantastic exercise for the third eye chakra, or “Ajna chakra”, one of the seven chakras. Helps you tap into your intuition. Helps with communication between the left and right hemispheres of the brain. Increasesn theta and delta brainwaves (which relaxes the brain). Helps us reach Samadhi, the highest state of concentration. In Hinduism and yoga this is the state at which we achieve union with the divine. The Gheranda Samhita (a Sanskrit text of Yoga in Hinduism) declares that one who masters Shambhavi mudra becomes equal to Lord Siva, Vishnu and Brahma. Strengthens eye muscles (this is actually one of my personal favorite advantages of the Shambhavi mudra). The key to doing Shambhavi Mudra successfully is to be gentle. One of the potential side-effects of the Shambhavi mudra is that it can give you a headache. This is the main negative effect of the Shambhavi maha mudra. When novices use the Shambhavi mudra they often get headaches because they are holding too much tension in their eyes. You will not get a headache if you keep your gaze relaxed. It is best to have your hands in Jnana mudra position when practicing Shambhavi mudra. (Read my guide to Jnana mudra). Sit comfortably with good posture and place your hands on your knees. Briefly shut your eyes then reopen them and focus your gaze on a fixed spot. Look up high but without moving your head. Focus your gaze on the spot in the middle of your eyebrows and concentrate on this area. Meditate on it. Let go of thoughts, as you would in regular meditation. You should be see your eyebrows as a V shape, with your gaze fixed in the middle of the V.
While maintaining this focus, chant OM. Meditate on the sound of OM reverberating around the spot you are gazing at. Do not strain your eyes. They should be relaxed at all times. Close your eyes but keep your gaze on that same spot in the middle of the eyebrows. Chant OM slowly while meditating on the sound. Begin to make each individual OM last longer. You should be breathing deep through your nose. My own experience of the Shambhavi mudra is mixed. The very first time I tried this mudra I ended up with a headache, which is one known side-effect of the mudra. However, that was because I was holding too much tension in my eyes. The next few times I was more relaxed. This helped a lot. No more headache. 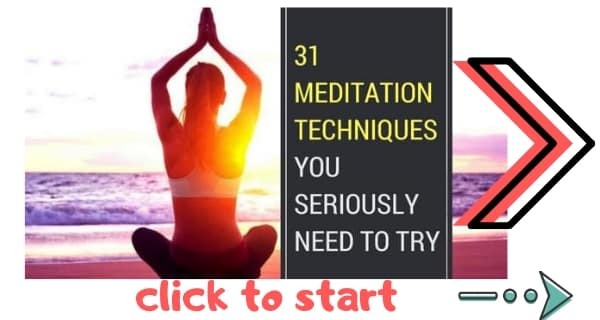 However, I also didn’t really gain any great insight, or at least no more insight than I get when I practice insight meditation. I now know how to do Shambhavi mudra successfully. The secret is being consistent. If you want to get the full experience of the Shmbhavi mudra you have to commit to it. After prolonged use you will open your third eye and awaken your higher self. I also asked our Facebook fans if they had tried the Shambhavi mudra and many said that they had. Sarah Robertson said she got a really bad headache. James Saunderson said he enjoyed the practice but didn’t really get a lot out of it. Penelope Smith said she tried the Shambhavi mudra for twenty minutes and afterwards she learned something she had never learned before and that the insight this mudra gave her was invaluable. I asked if there was anything different about the way she practiced the mudra. She said she did it in a very quiet room with mute light in front of her Buddha statue and early in the morning. This makes sense because the mind is still half in sleep mode early in the morning, and that relaxed state can make it easier to access insight. What about your own experience? If you haven’t tried the Shambhavi mudra, practice it now. Take ten minutes to practice the mudra now. You never know what insight you might uncover. I would love to hear how you get on with this. Leave a comment and remember to subscribe to our newsletter below, or get in touch via our Facebook and Twitter accounts. Oh, and one more thing, if you liked this article can you please be kind and share it? I actually use my shares as a way to gauge whether you guys like this content. So if you liked this, share it and that way I will know to produce more articles like this one. There is an excellent Shambhavi mahamudra kriya PDF about the effect of the mudra. Download it here. It gives me the yawns. lol Why?? To stop the yawning, while practicing this mudra I did the kechari at the same time and the tip of my tongue went much further back. Remember, guys, this mudra is powerful. But it has to be practiced properly. Any questions, let me know. I Would like to have the book as pdf. Sorry my email is [email protected].